A THREE-year project involving IoM Railways staff and volunteers to restore 1898-vintage Manx Electric Railway (MER) ‘Ratchet Car’ No. 14 will come to fruition in time for the September 1-8 125th anniversary of the MER celebrations. The project is the first time volunteers and MER in-house engineers have worked together on rolling stock restoration. 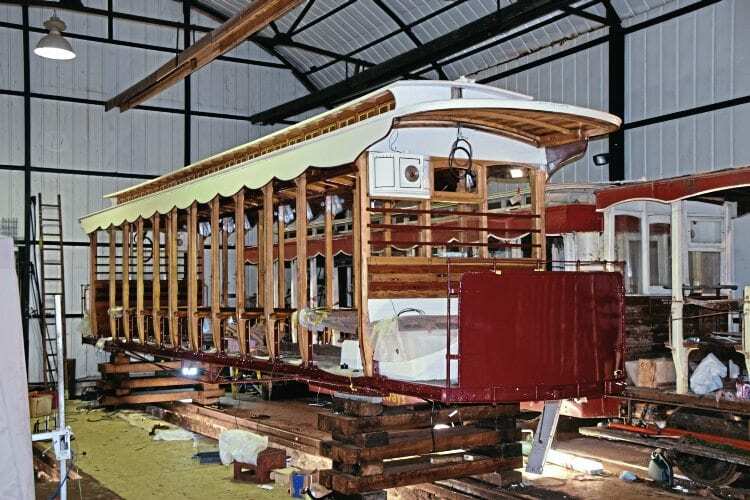 Volunteers stripped, repaired and cleaned the tram’s bodywork, while the railway’s engineers refurbished all mechanical components, including motors and electrical equipment, and are currently completely re-wiring the tram. No. 14 was one of a batch of open crossbench trams built by G F Milnes of Birkenhead in 1898. The trams used plate frame bogies, carrying two 20hp motors, which were supplied by Electric Construction Company of Wolverhampton for opening of the MER’s Laxey to Ramsey extension.